Prednylidene is a glucocorticoid for systemic use. 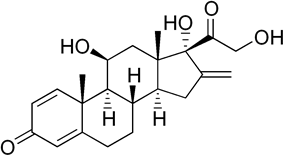 Substitution at position 16 also leads to more potent corticosteroids. The additional steric bulk introduced by such substituents adjacent to the dihydroxyacetone side chain also protects that moiety against metabolic degradation. ^ Buttgereit F, Brand MD, Burmester GR (July 1999). "Equivalent doses and relative drug potencies for non-genomic glucocorticoid effects: a novel glucocorticoid hierarchy". Biochem. Pharmacol. 58 (2): 363–8.